After a particularly painful encounter with another CMS, I figured it was time to try another. 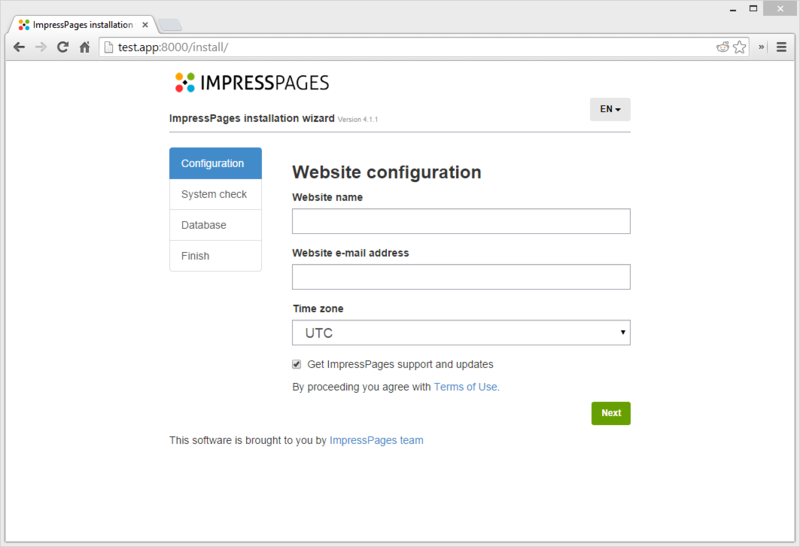 In this Quick Tip, weâ€™ll install ImpressPages – a CMS thatâ€™s recently been revamped to version 4, and the tutorial of which is coming out soon on the PHP channel. As usual, get your Homestead Improved instance up and running. If you did vagrant up to see if it works, do vagrant destroy so we can configure it. One thing to notice is that IP doesnâ€™t use a (now) traditional approach to safe folder access on servers (pointing vhost root to /public and leaving everything else outside it) – everything (even its logic) is in the public web root. This is a highly insecure practice – be warned. What Iâ€™m saying is: ImpressPages is, by default, highly insecure on Nginx. I will be publishing another Quick Tip soon on how to secure ImpressPages on Nginx. Edit: The IP team have published instructions on securing the app on Nginx here. In the host browser, visit the appâ€™s URL, but add /install at the end. In my case, itâ€™s test.app:8000/install. Since ImpressPages isnâ€™t configured for Nginx, we need to tell it that â€œmod_rewriteâ€� (which is an Apache module for URL rewriting) is actually enabled (even though it isnâ€™t). In the file config.php in the root folder, remove the line that says mod_rewrite is disabled. Restart Nginx with sudo service nginx restart. As you can see, ImpressPages is dead easy to set up. Even a non developer can easily install it onto a shared hosting server by simply unzipping – in this case, we went the extra mile and placed it onto Homestead for easier hacking and Linux testing.